As a research pharma or biotech, you face a complex and regulatory-heavy environment. New developing products make competition ﬁerce, while a trend in regulatory control of protocols and funding has created myriad challenges for building a case to maintain funding levels year over year. To keep time and funds spent during the clinical phases reduced and the information provided by subjects maximized, you may want to take a new look at the teams and professionals you use, and how you use them. Statisticians for one, can play a key role in efforts to enhance, optimize, and re-engineer process and operations. Please download this whitepaper to learn more about how bringing statisticians in early can optimize the clinical trial process. Good study design includes thoughtful planning and involves bringing subject matter experts, like statisticians, in early. Statisticians can take existing or historic trial data for a particular disease area and create hypothetical scenarios that can inform the shaping of a tighter, better designed trial. Good planning hones each aspect of a trial making it responsive, integrative of candidate data, and improves return on investment. 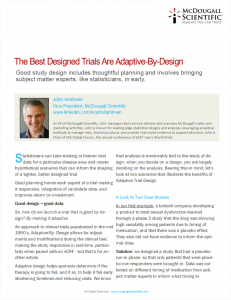 Please read this article to learn more about Adaptive-By-Design.